Sometimes, things in life just seem to align perfectly. It’s up to us to recognize these rare events as the special kismet that they are and take advantage of the opportunities and possibilities that they present. If you had asked me before May of this year if I was going to FinCon, I wouldn’t have known what you were talking about. Flash forward to today, and I am so happy to report that I went. Put very simply, it’s a formalized (but super fun) gathering of 2000 money nerds (and counting) on a mission to improve the financial lives of both themselves and others. In the quest to achieve this, conference attendees look to create mutually beneficial partnerships with brands, while spreading personal finance knowledge and tools to those in need. 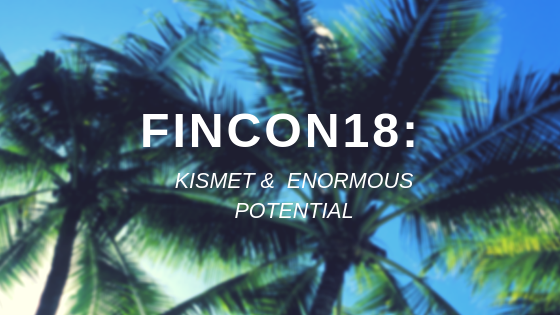 What are my FinCon Takeaways? #1: I absolutely CAN build a freelance business and continue to work remotely with a flexible schedule. I met many motivated and brilliant people at the conference that are each forging their own paths. It made what I’m attempting to do seem possible– and almost, dare I say, normal. I was surrounded by those that were rejecting conventional wisdom and pulling off what others scoffed at and deemed crazy. Seeing the success of my fellow conference goers was inspiring. Understanding where they came from and the driving force behind what they were doing was validating. I’m on the right track both in thought and in effort. At FinCon, I found a legion of kindred spirits and a well of support to draw from when I feel my fire starting to go out. I learned of the event right around the time I got serious about freelancing/online business. The event was in Orlando. I live an hour away– no airfare expense! I won a scholarship which covered the full cost of admission. I connected with Women Who Money a few months prior so I was able to share a condo with them (more money saved!) and actually know someone heading into the conference. I needed to get my business off of the ground and I was literally NEVER going to have the opportunity to attend so economically ever again. The universe spoke and I listened. #3: Even though I’m just starting out, attending this event was worth it! Not exactly a sponsor’s dream, right? Even though I’m not ready for Mediavine and no-one is knocking down my door to buy banner ad space, I was still able to have many meaningful conversations with brands. They saw that I have some solid writing chops that could fulfill their need for content. My blog posts counted for something and I already had several paid clips in my portfolio. We could help each other out. Their site would benefit from tailored and polished copy. And my site would benefit from additional backlinks. Although I didn’t close any new deals at the event, I am currently in talks with several brands and bloggers. I honestly believe I will see revenue in the near term. Perhaps the most unexpected (and utterly awesome) part of meeting with potential business partners– about half of the meetings were initiated by them! It was incredible to be approached by companies instead of having to chase them. There were a couple of meetings that absolutely blew me away because the company really researched me ahead of time and determined we could be a good mutual fit. Key point: It’s OK to be aware of your shortcomings so that you can work on improving them. But– BE AWARE OF YOUR TALENTS, TOO! And leverage them to take you to the next level. Bonus takeaway: Know your worth. Even if you’re not a household name in personal finance (or any other niche), don’t work for peanuts– especially if you have other better paying gigs currently, on the horizon or in the recent past. You know you’re more valuable than that and the opportunity cost of spending time on low paying work instead of hustling for a better gig is enormous. #4: Take the time to evaluate all opportunities. At first glance, some of the brand meeting invitations I was getting didn’t seem to be a good fit. I ignorantly assumed that they were only interested in sponsorship arrangements. Or I didn’t understand right away what they did. I almost turned down some of the meeting requests because I thought that there was mismatch and that the meeting would be unproductive. Boy, was I wrong. And I’m so glad that I pushed that type of thinking out of my brain in favor of being more open minded. I was going to FinCon to meet people and to explore opportunities. It would have been pretty foolhardy to limit my chances of making connections. BE OPEN MINDED IN BUSINESS! I can’t stress this enough– particularly if you’re just getting started and still trying to define your path. #5: Preparation helps a lot– but be willing to scrap the plan! I did a lot of research on the companies that were going to be there and the sessions that were taking place so that I could create a strategic plan. I was determined to derive the most benefit possible from the conference. I downloaded the conference app, took a lot of notes, bought a bunch of branded swag and scheduled quite a few meetings in advance. Absolutely not. I have some thoughts about how I can prepare even more effectively for the next FinCon (more on that another time). But– for the most part, I stayed on track and achieved what I wanted to accomplish. I did fail to stick to one part of my plan, though. I was originally going to remain at the conference site for every hour the conference was running. That didn’t happen and that’s OK. The event was truly awesome, but there were some moments when I just needed some down time to reflect and rest. When you go to an event like this, you need to allow for deviations to the plan. Listen to your mind and body. Lots of people are going to do the same thing– particularly introverts (like me). #6: Getting out of my comfort zone was necessary, valuable and enjoyable– but I also needed to respect myself. As an introvert by nature, I experience a lot of anxiety in large crowds. I have to make a conscious effort to not withdraw (mentally and physically) from social situations. By its very nature, FinCon was challenging for me– right from the get go. But– I still met many wonderful people, attended my scheduled meetings and approached other brands to introduce myself. I’m so glad that I did. I made friends, grew my network, took inspiration from others and hopefully planted the seeds for business growth. That would have been impossible if I kept more to myself– or worse yet, not attended at all. I’m also glad that I gave myself the time I needed to regroup when I felt drained or overwhelmed. I’ve learned that respecting your own boundaries can actually help you expand them. By taking my rest breaks, I could return to the action with a reset mind and I could connect better and participate more. #7: I need to get more clear on who I serve. Emma Johnson spoke in depth about this and she is absolutely right. I can be more impactful if I focus my message solely on my target audience. I can make more of a difference if I go narrow and deep, than if I go wide and shallow. The key? Defining my target audience, or my avatar. After her speech, I realized that my reader is probably a lot like me– older Millennial (Gen Y, anyone? ), well-educated, decent career, may or may not have spouse/kids and interested in exploring alternative work arrangements to refocus their life. I’ve always thought about leaning in that direction but now I’m a lot more sure. How do I best reach my audience? That’s still in the works. But, at least I have a solid direction to pursue. #8: We are doing important work– and there is more than enough to go around. Chris Hogan underscored the importance of the work that the personal finance community does. He implored– so many people are financially drowning, completely directionless. We can help them. We must help them. It’s important to remember that there are more people in need of help than there are personal finance content creators and experts. Many more. We all have unique ways to reach people– so there is room for all of our voices, and then some. #9: If I’m passionate about my content and create lots of rich and deep posts, the audience (and money) will come. Being passionate shows that you care and it’s absolutely contagious. Everyone likes to be inspired. To know that what I say could make someone’s life better is both humbling and motivating. It also rightfully places a lot of responsibility on my shoulders. I need to offer candor and transparency to my readers so that they can more accurately assess if what I’m saying applies to them or can help them. While I won’t be sharing every detail of my life, I’ve come to realize that there are important parts of my money story that I haven’t yet discussed– and should. I’ve held back on certain angles in an effort to maintain the privacy of others involved. But, as my ever-honest and completely brilliant fiancé told me– leaving these things out makes my story incomplete, a half truth. Not only am I denying my readers the transparency that they deserve, I’m also missing out on making more genuine connections. Telling more of my story will also help me better define my avatar so that I can reach a greater number people who may benefit from my content. I truly hope that I can be helpful. I’m still planning out the sequence of these posts and garnering the courage to write some of them. I’m typically comfortable talking about my own shortcomings or less than ideal circumstances, but it’s harder to discuss those when someone else is involved. I am thankful for FinCon and the subsequent conversations about finding my niche, reaching my audience and just getting even more real than I already have been. I’m excited to see what additional passion, transparency and authenticity can do for both me and my audience. #10: Since I’m starting to make money (YAY! ), I need to shore up my business infrastructure. With activity from the conference (and before), I hope to have a full freelance dance card before the year is over! That’s exciting! However, I need to finish setting up my business so that I can remain successful — and in compliance! I’ve already done prudent things like register my business name, find a free invoicing system, set up a Paypal account and procure branding materials. However, I still need to get an EIN, set up reminders to file quarterly taxes, open a business bank account and seriously consider purchasing professional liability insurance. I’m watching myself go from hobbyist with a dream to legit business owner in pretty short order– I need to stay on top of my entrepreneurial game! #11: I need to be patient and learn how the game is played– but I also need to maintain my hustle. I’m an impatient person by nature. I want it yesterday. I know– it’s a major flaw. I promise that I try to keep it in check and bring myself back to earth when necessary. I remind myself constantly that I’m not going to make <insert obscenely large amount of money here> overnight. 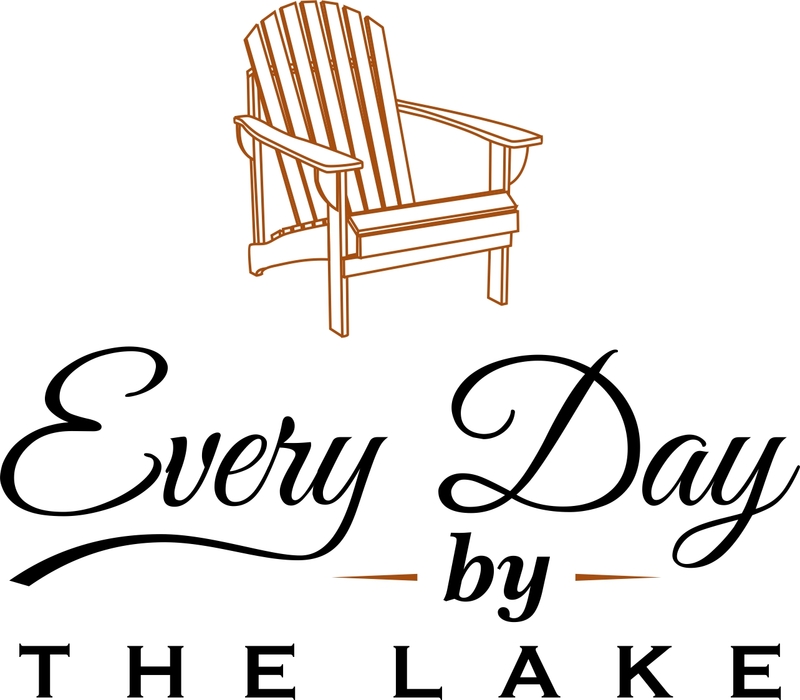 I’m also going to be “Every Day by the Lake” who? for quite awhile. I’m learning that I probably shouldn’t pitch article ideas to xyz entity without getting published by abc outlet first. It’s a little maddening– I’m not going to lie. But I know I need to earn credibility. That takes time and I’m willing to put it in. However, that knowledge doesn’t deter me from hustling hard– quite the opposite. Even though there is a natural progression that I can expect, if I put in the effort, I may be able to achieve my goals faster than say, someone who pursued them more leisurely. That makes my impatient side happy! I took a chance on myself and went to FinCon. It was seriously the greatest professional event that I have ever attended and I believe it has shaped and jumpstarted my business in ways that I don’t even know of yet. I can’t wait to see what the next several months hold. I’ll be sure to tell you all about it! Was great to meet you in person at FinCon-and best of luck in all your future endeavors! It was great to meet you, too, Liz! Really enjoyed your MBA session. Have an awesome year ahead! I wish I could have gone. Maybe next year. That is so awesome that fincon was so close to home. Now if they could just have fincon in Seattle. Lol. It’s totally worth it, Shawn! I’m actually surprised it hasn’t been held in your neck of the woods! Nice blog Laura, really enjoyed reading that and what you learned. I do agree that there is enough for everyone in the Ocean. You have your style and will attract a good crowd! Look forward to your near future! Thanks so much, Mo! I’m watching your story with keen interest as well. Best wishes! Hi Laura! It sounds like you had a great time at FinCon. I hope you had a chance to get to know our team while you were there! We would love to have you join us at Mediavine. Our threshold is 25k sessions within a 30 day period, which you’ll quickly reach if you keep up the awesome content creation. Thanks so much for the shoutout. Good luck on your goals and we’ll see you soon! 2018 was my first FinCon too, and I agree with you it was the best professional conference I’ve ever been to. Glad I found your blog! Thanks for reading, Raina! I just took a look at your site– it looks great! Fabulous job Laura with all you are doing and with this incredible post. You are so good at what you do and I admire you.